The SBGrid softare collection can be installed using our graphical installation client for Apple OSX computers running MacOSX v10.11 - 10.14 . BIOGRIDS users - Instructions can be found here . A command line version is also available for mac and linux - installation instructions can be found here : CLI installation. 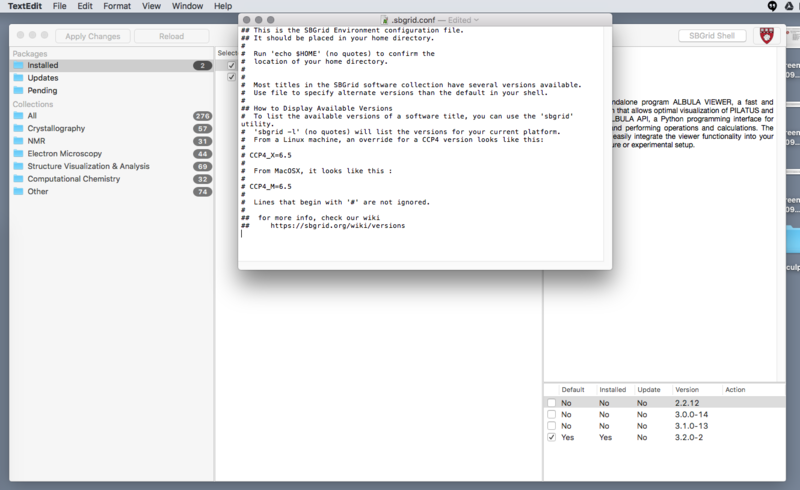 The command line installation client is compatible with and can be used along side the graphical client. 1. Admin access required. The SBGrid installation client will install the software tree to /opt/sbgrid and create a symlink from this directory to /programs. While admin privileges are not required to run the application, you will need admin privileges to create /opt/sbgrid and /programs . 2. Existing installations must be renamed or removed. If you have previously installed SBGrid software on your computer at /programs or at /opt/sbgrid, these directories should be removed or renamed. The client will create these on first run. 3. Hard Drive Space Depending on what you install, ensure that you have enough free hard drive space on your machine. 4. 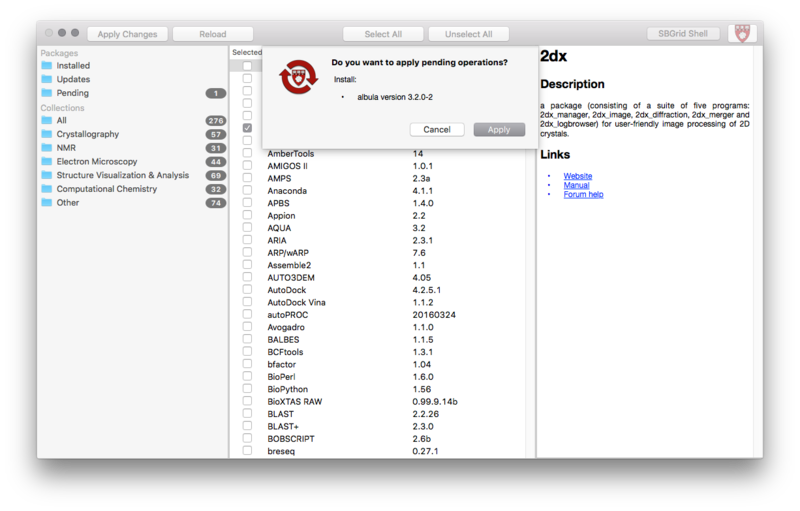 XQuartz is required for many graphical applications on MacOS. To use many of the graphical applications (COOT, CCP4, nmrDraw, etc), install the latest Xquartz version offered on the MacOSForge site. 5. For large packages (Phenix, Rosetta, CCP4), a wired connection is recommended. Some packages are quite large and can be slow to download, especially over WiFi. 1. Download the latest SBGrid installation client from here. 2. Mount the .dmg disk image on your Mac. Copy the 'SBGrid installer.app' to a convenient location - it does not need to be in /Applications. 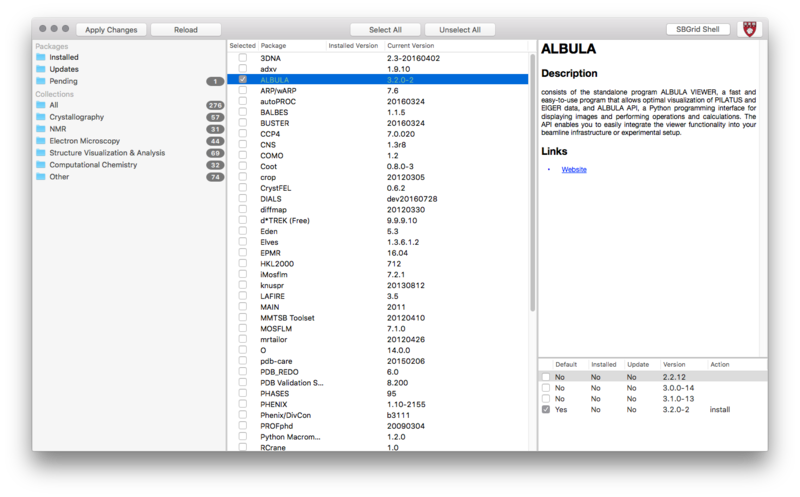 The .app bundle can be run directly from the mounted dmg image with no installation if desired. 3. Enter your site, user name, and key. You should have received these by email. 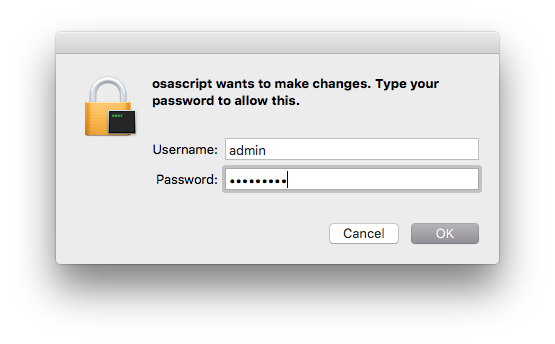 On activation you will be prompted to provide admin credentials for your mac. This is to create the /opt/sbgrid directory and /programs symlink. 4. On successful activation, you should see the client populate with software titles. If not, please close the application and try again. If activation continues to fail, you may have an old SBGrid installation at /programs or /opt/sbgrid. These should be removed. You may also be blocked from accessing SBGrid servers on port 873 and port 8080 by your institution's firewall. You can check if you can access port 873 here and port 8080 here For help, email bugs@sbgrid.org. Currently the installer application installs the software tree in /opt/sbgrid and uses a symlink at /programs. The /programs link is required for the software to work, but in principle the software can be anywhere by linking /opt/sbgrid to the desired installation point. This functionality is not yet included in the SBGrid application, but can be set up manually post-install with a symlink. First do an install (into /opt/sbgrid), then move it to the desired localtion. Then symlink to the new location from /opt/sbgrid. Example: 128Gb USB 'key' drives are available on Amazon for 30$ or less and are a nice way to supplement the small SSDs that come in Mac laptops. To install on an external drive in this way, first mount it on your computer. For this example, the mount is /Volumes/sbgrid_client_install. Then, using the SBGrid installer, do an initial installation on the hard drive. To make life easy, just do one application. Then close the installer application. The SBGrid software installation client is a GUI-based installer for the SBGrid software collection. The application allows for selected applications to be installed in the familiar SBGrid environment. The client GUI is displays software 'Collections' on the right panel with folder icons under the 'Packages' heading. These Collections control the list of titles displayed in the center 'main' panel. The first of two of these 'Collections' are shortcut meta-collections of the local machine. The first is the currently installed titles. The second icon, Updates, shows updates available from SBGrid. 'Pending' is a collection of pending installs and removals. Below these shortcuts are packages are grouped by primary scientific uses. Installation status is also indicated in theses collections. Information about each title, including a description and links to documentation are shown in the upper right panel when that title is selected in the main pane. Once packages have been configured for installation and/or removal by selecting their checkbox, clicking the 'Apply Changes' button will perform update the titles, adding pending installations and removing pending deletions. Check the box to select Albula, then click the 'Apply Changes' button. Notice the text turns green for pending installations. Pending updates are Orange. Uncheck the box for Albula. Removals are shown in red text. Click apply changes. 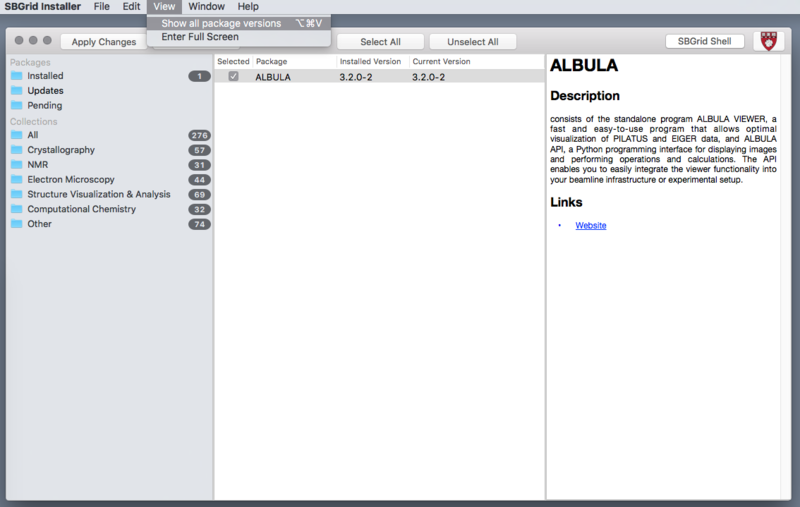 Albula will be removed. 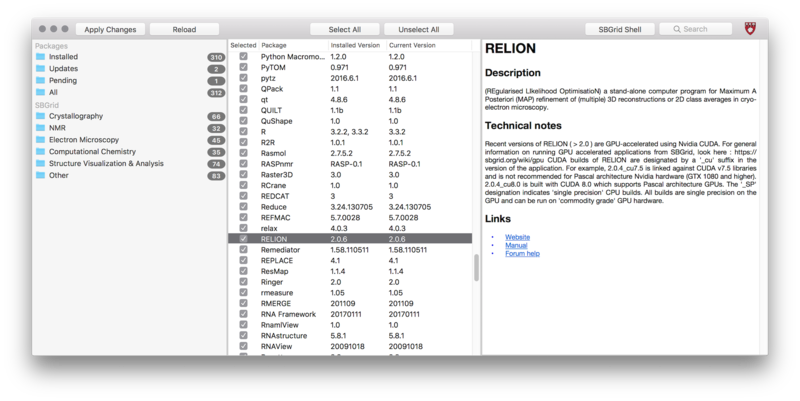 Default versions are installed by default for each application, though individual versions can be selected for each title. To do so, show the version pane by selecting "Show all package versions" from the "View" menu. Then, in the bottom right, select a desired version with the check boxes. Multiple versions of a given title can be installed and are indicated in the main panel. If you have a single version of an application installed, explicitly version selection in your environment will not be needed. In the case of multiple installed versions, the SBGrid Default version will be the version available at the terminal when installed, unless configured otherwise in ~/.sbgrid.conf. If you have multiple non-default versions installed, the latest release will be version available in your shell. If you would like to have more than one version of a title installed, and prefer to use either an older release or the non-default version when a default version is installed, you must set this explicitly in your ~/.sbgrid.conf file as in the standard SBGrid environment. You can do open the configuration file by selecting the "Edit Configuration File" from the "SBGrid Installer" menu. This will open a text editor with a sample configuration file, or your ~/.sbgrid.conf file if you have one already. To run the software, you can click the "SBGrid Shell" button for an initialized bash shell. For questions or problems, the Help menu will direct to the SBGrid help page. Or just email bugs@sbgrid.org. If relevant, please include a screenshot of the GUI if possible (command + shift + 4) and please include the ~/Library/Application Support/SBGrid/sbgrid.log file with your report. rsync required on 873 or 8080. The application will fail if outbound port 873 and port 8080 are blocked by your institution or are otherwise not available. Activation Failed. In some cases the Authorization dialog for admin privileges does not appear during activation. This causes the client activation to fail. This is usually due to a previously existing /programs directory or symlink from a prior installation. This must be removed for activation to be successful. Other users have reported successful activation after a restart.